Pimatic plugin to show weather informations form the "Deutscher Wetter Dienst". The informations where only available in german from the DWD so the output is only in german. At the moment the software is at a development stage so please use it with caution. The owner of the data and the copyright holder is the "Deutscher Wetter Dienst". The resolution of the data is NOT on city level but rather on district/county level, because you have to pay the DWD for a finer resolution. Here you you can find some additional data about the data source: "Data object description"
The Data form the DWD where updated on there servers every 10 minutes. The usage of this plugin is quite easy. After you installed the plugin over pimatic please restart pimatic ! 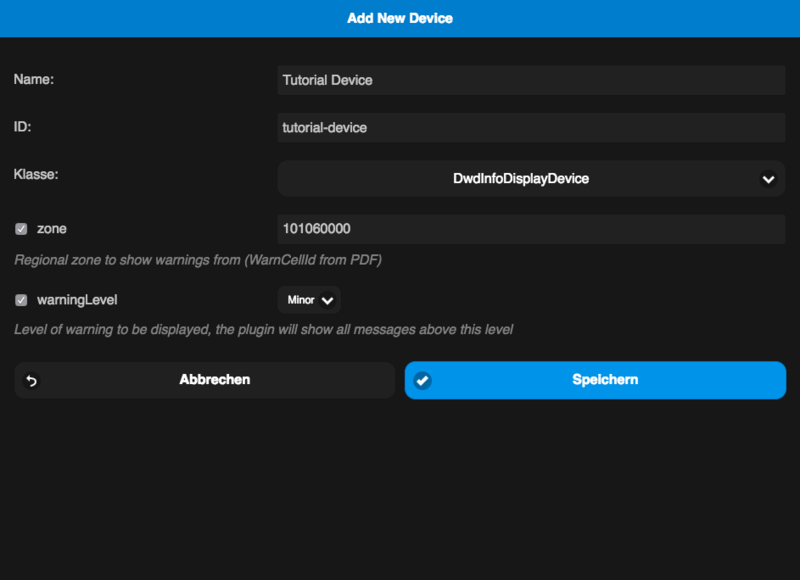 After that you add a new device of the type "DwdInfoDisplayDevice" over the device manager in pimatic. You need to select the nearest zone id from the PDF file or the list below and add this to your device config and select the lowest level of informations you want to show. If you get an error after the first install, or the device is not showing up in the backend, please clear your browser cache so that pimatic renders the newest templates ! 109373000 Kreis Neumarkt i.d. OPf.